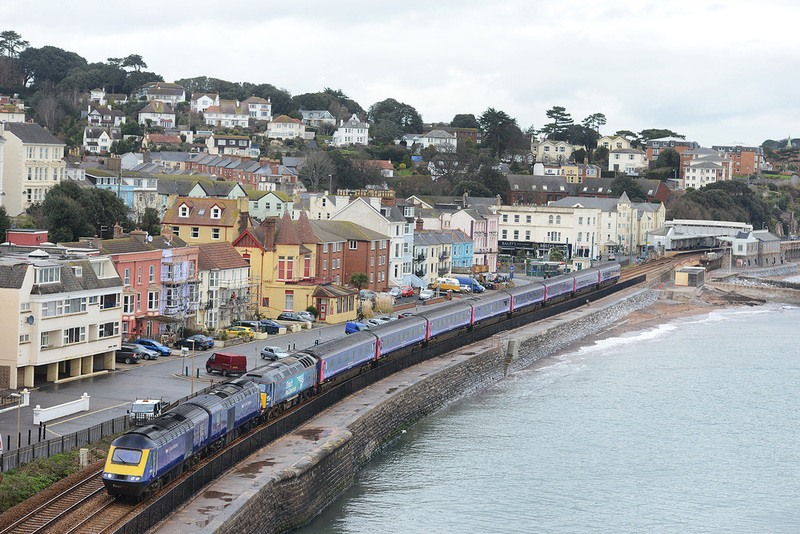 FGW advertising-liveried Class 158 No. 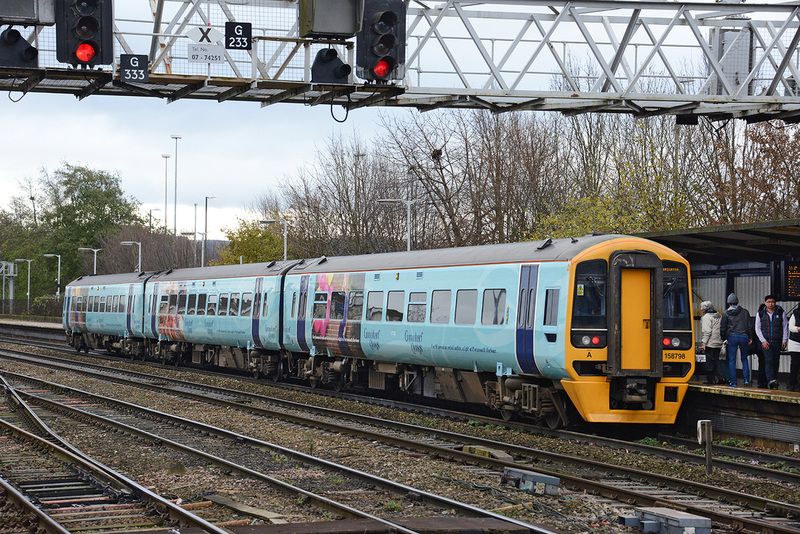 158798 arrives at Gloucester, 1O98 10.50 Great Malvern to Brighton, 17 December 2014. EWS-branded Class 66 No. 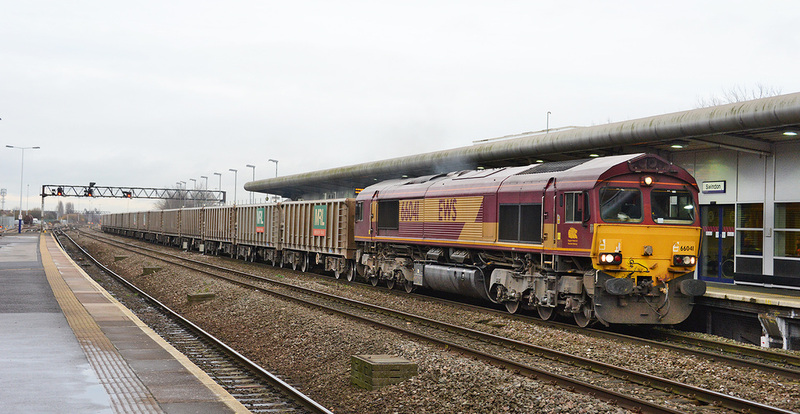 66040 passes Gloucester on 17 December 2014 with 10.16 Round Oak to Margam empty steel. 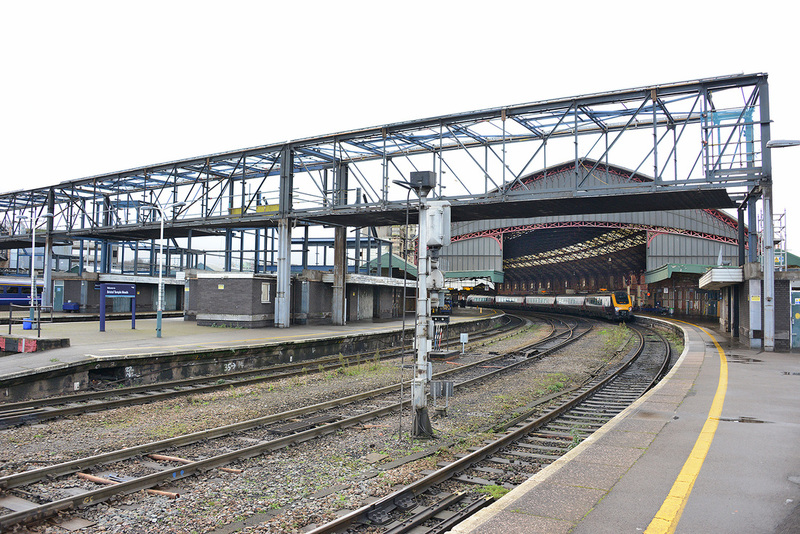 Bristol Temple Meads, removal of old Post Office bridge as part of station electrification work. 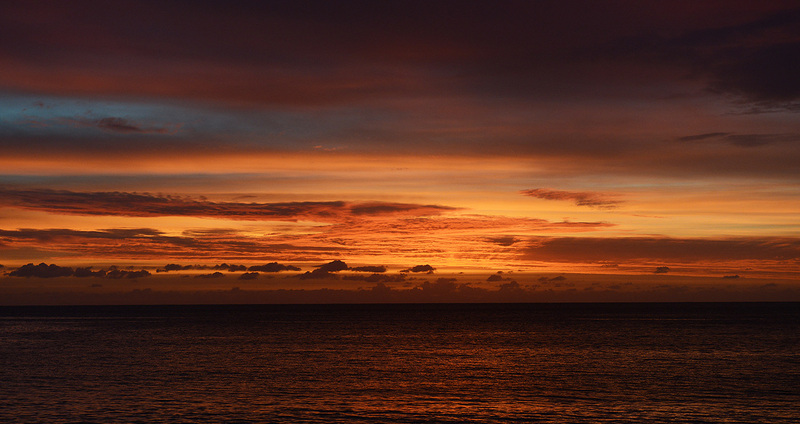 17 December 2014. EWS-branded Class 66 No. 66041 passes Swindon on 17 December 2013 with 13.06 Oxford Banbury Road to Westbury empty stone. Colas Rail Freight Class 60 No. 60021 powers train 6V62 the 11.22 Tilbury Riverside to Llanwern Exchange sidings through Swindon on 17 December 2014. DB-Schenker Class 60 No. 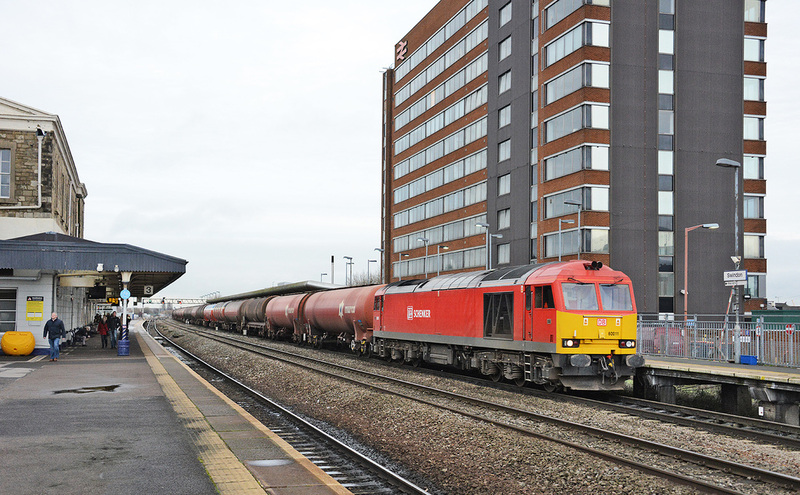 60011 passes Swindon on 17 December 2014 with the 13.00 Theale to Robeston Murco empty oil. 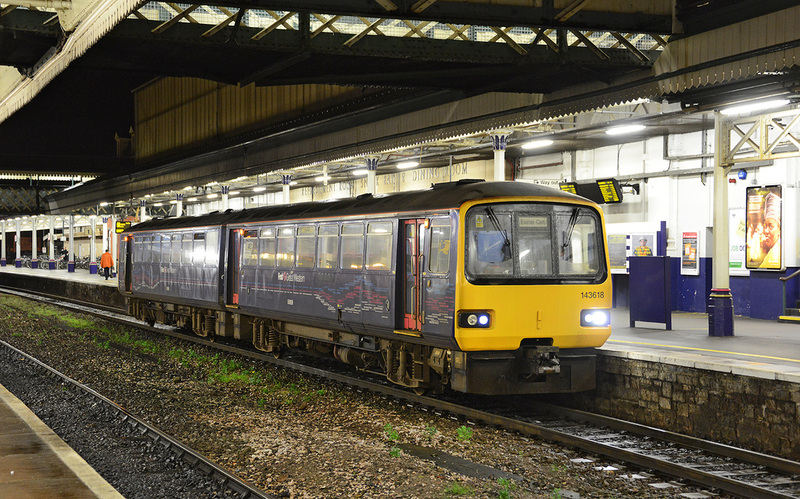 143618 stops at Exeter SD, 2R93, 17.13 Barnstaple to Exeter Central 17 December 2014. 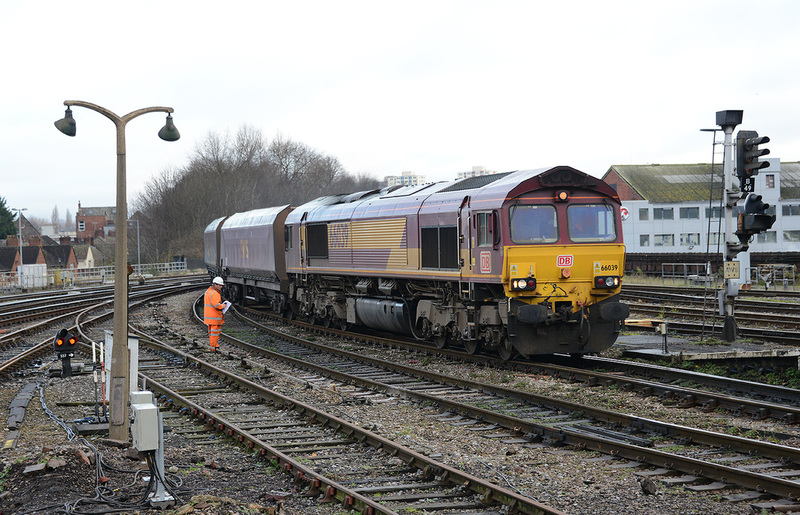 On a very dull 18 December 2014, Network Rail Class 950 No. 950001 emerges from Kennaway Tunnel working test train 2Q08, the 04.12 Penzance to Exeter via St Ives, Goodrington and Heathfield. 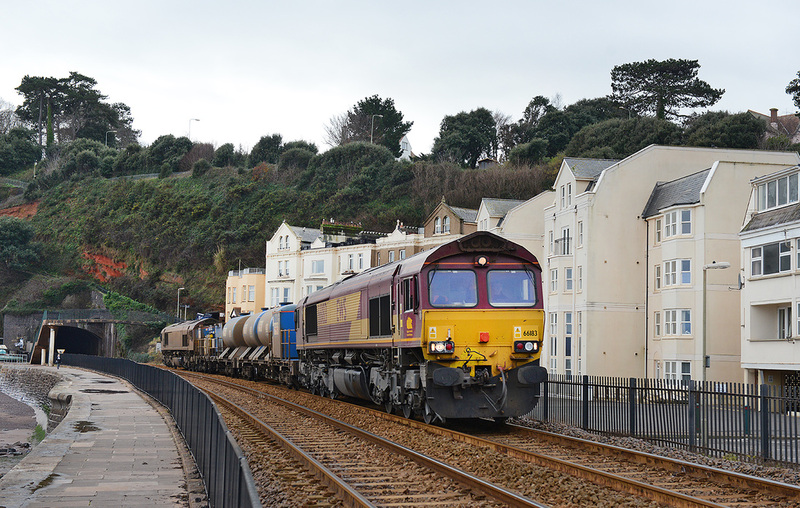 950001 down Dawlish, 16 December 2014, 2Q08 04.56 Didcot to Plymouth. 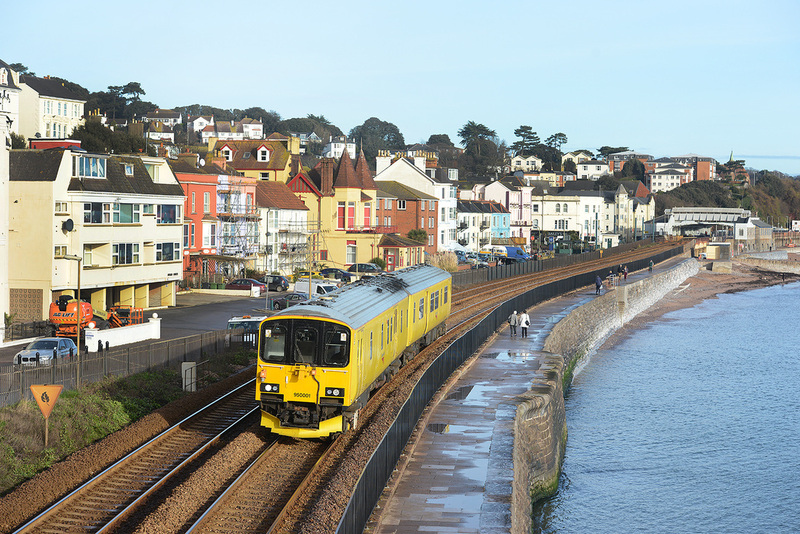 In terms of unusual motive power, this MUST rate as one of the workings of the year on the Dawlish Sea Wall. Following yet another failure of hired-in DRS Class 57/3 No. 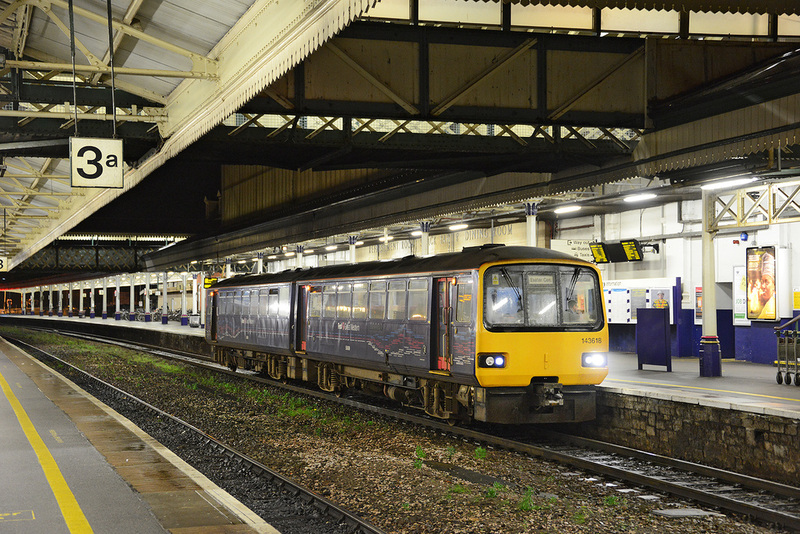 57310 working the down sleeper from Paddington to Penzance on the night of 14/15 December 2014, the train was terminated at Exeter St Davids. After being hit with a hammer, FGW tried to work the 57 through to Plymouth with the stock, but after just a a few yards it again failed, having to return to Exeter St Davids. 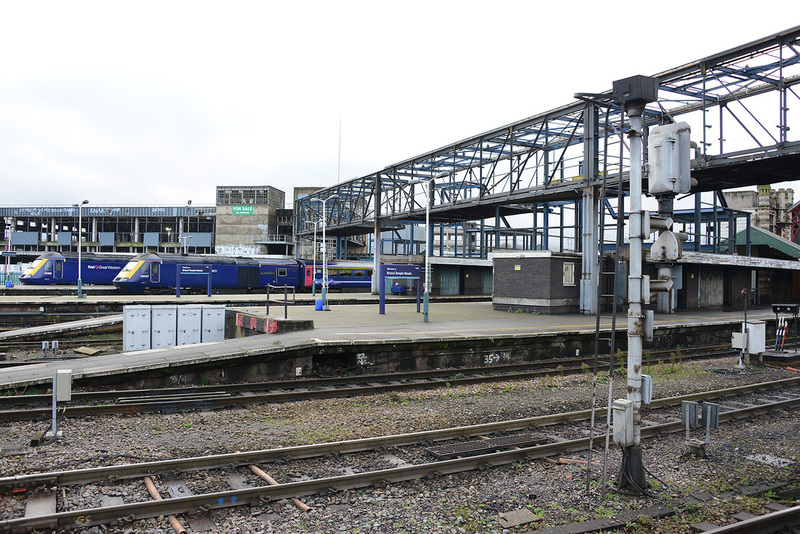 With no other motive power avaialble, two HST power cars were then sent light to Exeter from Laira to rescue the train. Here Nos. 43149 and 43187 pilot dead No. 57310 and the sleeper stock through Dawlish operating as train 5Z77, the 12.32 Exeter St Davids to Laira depot. It is worth recording that on 15 December the entire fleet of FGW 57s were out of traffic! Class 150/1 No. 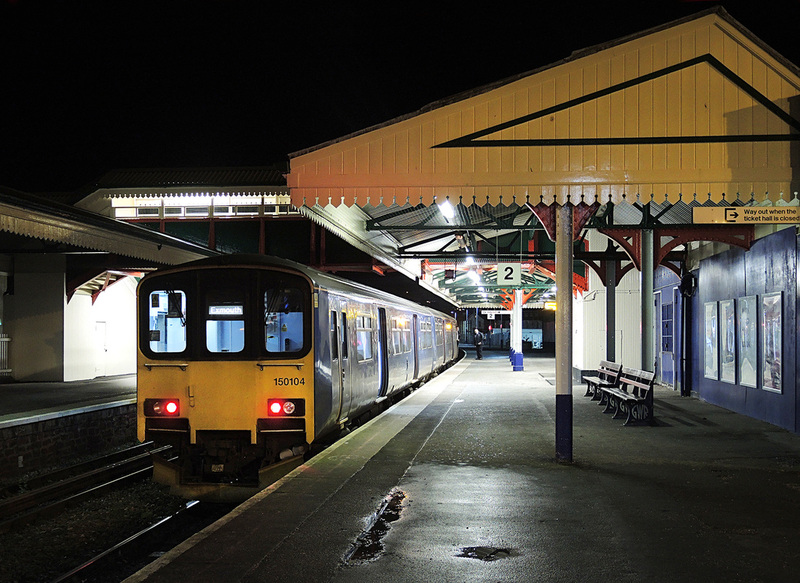 150104 stands at Paignton station on 10 December 2014 awating departure with train 2F57, 20.35 Paignton to Exmouth. 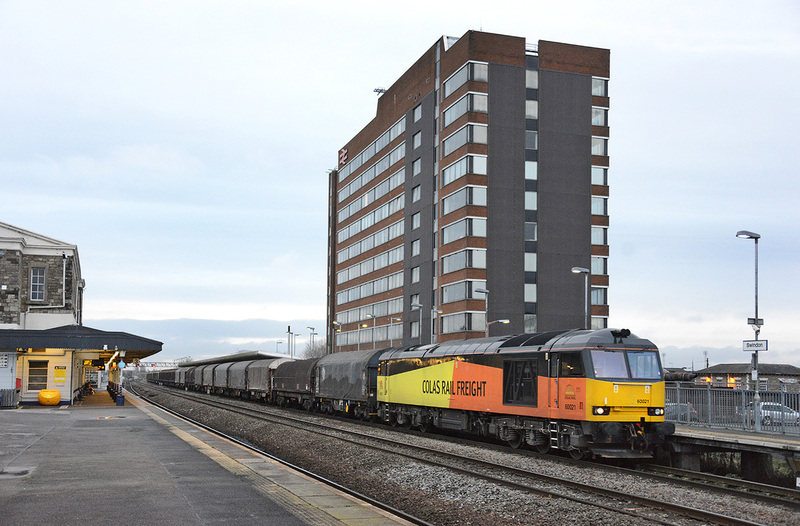 Colas Rail Freight No. 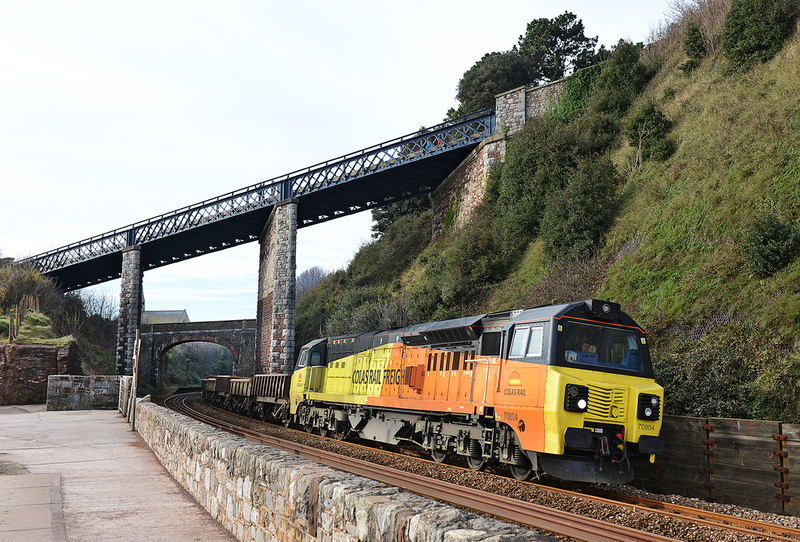 70806 emerges from Kennaway Tunnel, Dawlish on 10 December 2014 forming train 6C27, 12.30 Tavistock Junction to Westbury loaded ballast train. DB-Schenker Nos. 66183 and /66194 'top and tail' the RHTT set past Dawlish on 9 December 2014 running as train 6Z12, the 09.53 St Blazey to Westbury, returning the RHTT after the 2014 leaf fall season. 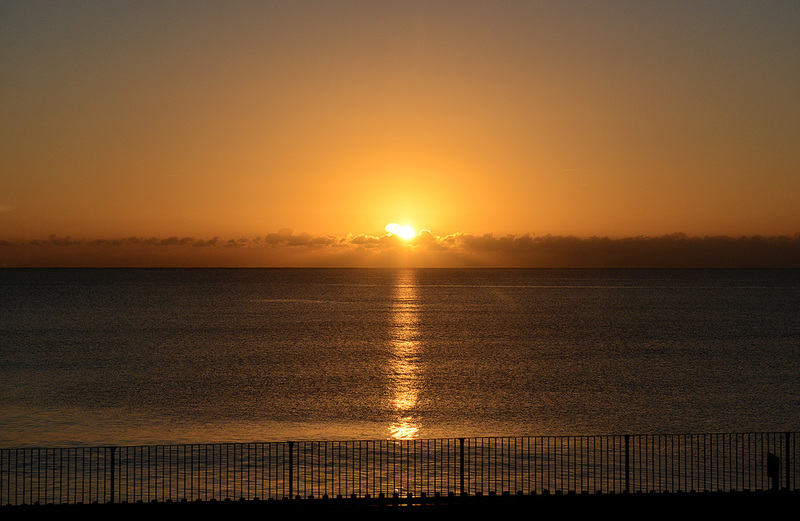 Sunrise, Dawlish 06 December 2014. Colas Rail Freight No. 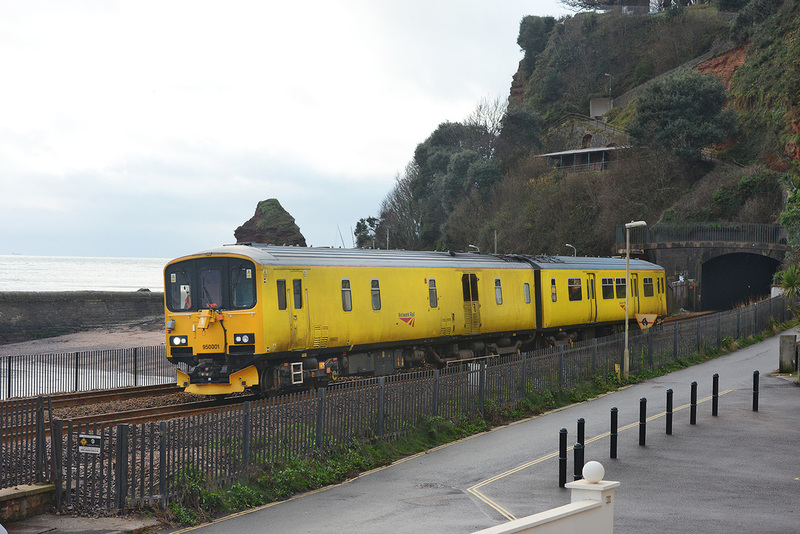 70802 passes Dawlish on 4 December 2014 powering train 6Z70, the 13.45 Exeter Riverside to Tavistock Junction, loaded ballast, the train was running 100 minutes early. 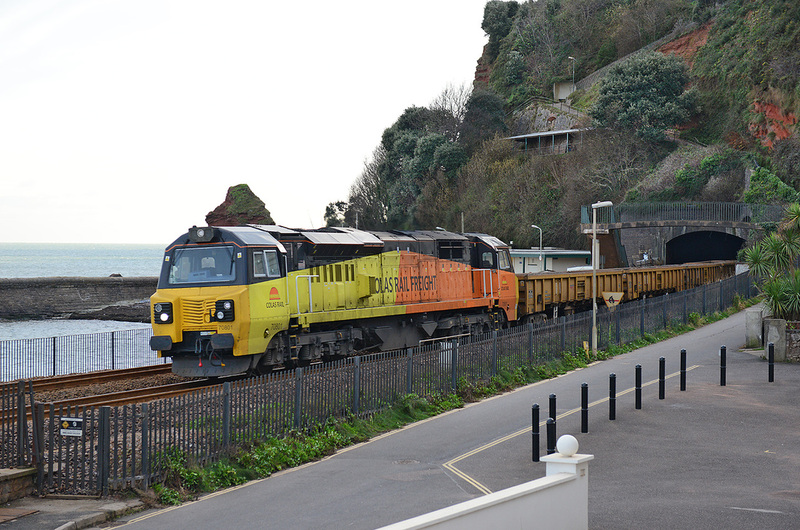 I think the Colas Class 70s must now be the most photographed class on the Devon Sea Wall, at least they add a bit of colour. On 2 December 2014 No. 70804 powering train 6C20, the 09.28 St Blazey to Westbury, is seen 'storming' under Skew Bridge at Teignmouth and turning onto the sea wall section. Colas Rail Freight Class 70 No. 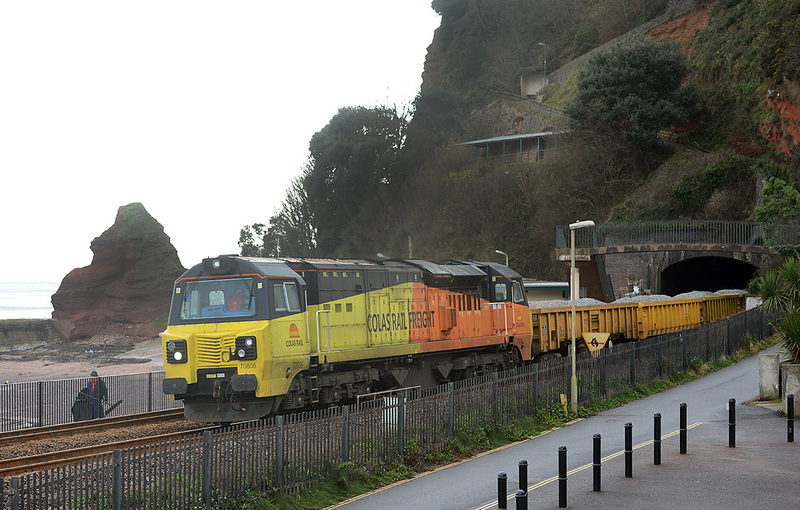 70801 emerges from Kennaway Tunnel, Dawlish on 2 December 2014 forming train 6C21 the 13.03 Par to Exeter Riverside.